December 2012 – Cielo Spa Boutique’s Cranberry Enzyme Facial was featured in 805 LIVING Magazine’s article “Holiday To-Do List.” The article highlighted local treatments to help consumers stay relaxed and pampered during the holidays. September 2011 – Featured in the “Fit Wise” column — Jason Baker asks Cielo Spa advice about skin care. Roxanne Zbinden, Santa Barbara skin care expert shares tips. September 2011 – Cielo Spa Boutique’s Owner, Roxanne Zbinden was interviewed about how to recycle spa equipment in the “Go, Go Gadgets” article. February 2011 – Cielo Spa Santa Barbara’s “Champagne Facial” highlighted in a Day Spa Magazine article about the beneficial effects of vinotherapeutic treatments. March 2010 – Roxanne Zbinden, Santa Barbara Spa owner interviewed in a “Waxing for Your Health” article. December 2009 – Cielo Spa Santa Barbara was featured in SB Magazine’s Home & Garden … Light Up the Night article for her eco-friendly candle options for sale at her spa’s boutique. April/May 2009 – Cielo Spa Boutique in Santa Barbara was featured in the Road to Wellville, Spa Relaxation and Rejuvenation for Santa Barbarans article in SB Magazine. January 20, 2009 – The The Huffington Post, #1 Internet Newspaper has an article from Paige Donner (The Green Hollywood Reporter) where she reviews Cielo Spa’s treatments and talks about Eco-friendly spas in Santa Barbara. August 2008 – Cielo Spa Boutique featured in Health and Beauty … Dare to Go Bare, Top Waxes article. Cielo Spa Boutique is a go-to for waxing, known for the quality waxing products and technique. August 2008 – Carlos Cuellar, Santa Barbara artist has his expressionist works on display at Cielo Spa Boutique in Santa Barbara. Santa Barbara Spa Owner Roxanne Zbinden commissioned Cuellar to do works for her spa that represent the area including a painting of the Santa Barbara Mission. April 2008 – Busy Working Woman’s Night Out event at Cielo Spa Boutique covered in the SB News Press. April 2008 – Santa Barbara Day Spa’s organic skin care featured in the Salon area of the SB News Press. March 2008. Cielo Spa Boutique, a Santa Barbara Day Spa is included in this Santa Barbara travel book for their massage, facials and more. 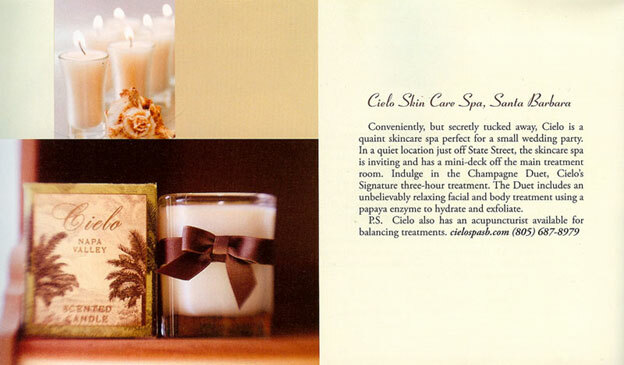 Summer 2007 – Cielo Spa’s private boutique Santa Barbara Spa gets written up for their healing and relaxing experience. Spring 2007 – Roxanne Zbinden interviewed by Coastal Woman magazine.